Groupe Rock 'n' Roll suédois formé en 1959 à Göteborg (Suede) par Bo Winberg avec Bob Lander, Ove Johansson et Björn Thelin. If remembered at all today, it is probably thanks to their silly astronaut costumes, but in the '60s the Spotnicks were one of the most successful instrumental rock groups, alongside the Shadows and the Ventures. Their very specific sound had more in common with the Shadows, being clean and intentionally gentle. It originated from their first primitive demo recordings, but the record company liked it and, being plastic and twangy, it was promoted as a space sound. Already in the late '60s it was outdated, but that didn't stop the group from having big successes throughout the decade. In the '70s the sound was definitely antiquated, but like the Ventures, the Spotnicks found reliable audiences in Japan and Germany, as well as a cult and nostalgia following around the world. The Spotnicks have sold over 20 million albums, making them among the most successful Swedish groups ever, surpassed perhaps only by ABBA and Roxette. By the late '90s they had released 39 studio albums, recorded roughly 700 songs, and had more than 100 members in the different constellations of the band. The Spotnicks were formed in Göteborg, Sweden, in 1957, by guitarist and undisputed bandleader Bo Winberg. The other members were guitarist and singer Bob Lander, drummer Ove Johansson, and bassist Björn Thelin, several of whom had already played together in local rock & roll bands like the Blue Caps, Rock Teddy, and the Rebels. 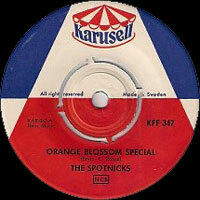 The first year they performed under the name the Frazers, but soon changed it to the Spotnicks. In 1961 they were signed by Karusell and released their first singles containing mostly instrumental covers of famous songs. The selection of songs was as varied as the performances were homogenous, including titles like "Hava Nagila" and "Johnny Guitar." 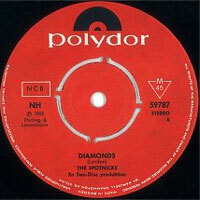 Later the same year, the Spotnicks toured Germany, France, and Spain, and in 1962 they released their debut album, The Spotnicks in London, recorded on their first trip to England. 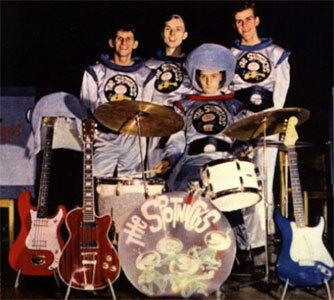 Featured on this tour were the space suits that the band would wear on-stage until 1969. 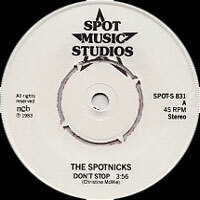 In 1969 the Spotnicks disbanded, but Winberg continued to record using the name until the group reunited in 1972 upon the request of a Japanese record company. The same year, "If You Could Read My Mind" from the album Something Like Country became a big hit in Germany. The Spotnicks would retain their popularity there for a long time, even as it faded elsewhere. Only the Japanese audience proved more faithful and, accordingly, the Spotnicks devoted most of their touring during the '70s to these two countries. After the release of 1972's Something Like Country (the Spotnicks' best album according to many fans), they had practically ended being a band, consisting mainly of Winberg and various session musicians. If the Spotnicks had started out as rock & roll, in the '70s they turned more toward easy listening, or even exotica, although perhaps not by changing their own sound as much as by stubbornly keeping it while trends changed. By the '80s they had essentially become a curiosity at home, but kept up their popularity in Germany and Japan. During the '90s Winberg still toured using the name the Spotnicks, but to little attention. And even in their hometown of Göteborg, the Spotnicks were mainly forgotten, except for an occasional article in the local paper reminding readers of some guys with silly helmets who were once international stars. THE SPOTNICKS MED BOB LANDER - Hey, Good Lookin' / What Did I Say? 1962 SP KARUSELL KFF 405 (DK) THE SPOTNICKS MED BOB LANDER - Hey, Good Lookin' / What Did I Say? Iskrigarnas Inmarsch - Western Blue Star / Go, Go, Frölunda Go! 1973 SP POLYDOR 2053 178 (SW) . Jämtländsk Brudmarsch / Theme From "The Persuaders"
Bo Winberg & The Spotnicks - Wichita Lineman / Theme From "For A Few Dollars More"
1978 SP PRESIDENT PRE 10281 (F) ? / ? 1980 SP POLYDOR 2002 000 (SW) Sweet Little Lisa / Theme From "Soap"
Papa-Oom-Mow-Mow / Theme From "Soap"
1989 SP CARRERE 14672 CA 171 (F) Amapola / ? 1995 CD RCA 74321 27808 2 (SW) I'm Gonna Take You Home / ? 1963 LP 12" PRESIDENT KVP 162 (F) DEVENEZ SOLISTE DES SPOTNICKS - The Spotnicks Theme / Play-Back De "The Spotnicks Theme" / Western Guitar / Play-Back De "Western Guitar" / Galloping Guitars / Play-Back De "Galloping Guitars" / Last Space Train / Play-Back De "Last Space Train" / Happy Guitar / Play-Back De "Happy Guitar" / Comme Ci, Comme Ça / Play-Back De "Comme Ci, Comme Ça"
1989 CD CARRERE 96720 (F) AMAPOLA - Amapola / Highway Boogie / Lost Prosperties / Migty Bump / Dolly H / Delightful Morning / The Hittenon Dance / Nas Onih / Tomilla / Telstar / Etoiles / Another You / Wilhelm Tell / Reversed Boogie / Horga Mélody / 3 O'clock Click / Love Me Tender / A Touch Of "A"
2003 CD MAGIC 3930269 (F) DEVENEZ SOLISTE DES SPOTNICKS - The Spotnicks Theme / Play-Back De "The Spotnicks Theme" / Western Guitar / Play-Back De "Western Guitar" / Galloping Guitars / Play-Back De "Galloping Guitars" / Last Space Train / Play-Back De "Last Space Train" / Happy Guitar / Play-Back De "Happy Guitar" / Comme Ci, Comme Ça / Play-Back De "Comme Ci, Comme Ça" / Bonus Tracks: «Devenez Le Chanteur Des Spotnicks» - Say Mama / Play-Back de "Say Mama" / Blue Blue Day / Play-Back de "Blue Blue Day"